Get lifted with our X-Lift treatment for Face and Body. The treatment uses Exilis Elite, the first FDA approved new generation radio frequency technology that rejuvenates the entire face by tightening the skin and stimulating the production of collagen to soften wrinkles. Because of its results which are visible as quickly as immediately from the first session, it is seen as a safe and great alternative to an invasive facelift procedure. You can now grow old gracefully in every sense of the word. One of the highlights of this machine is the ability to scientifically and systematically control temperature rises and not just base it on patient feedback. 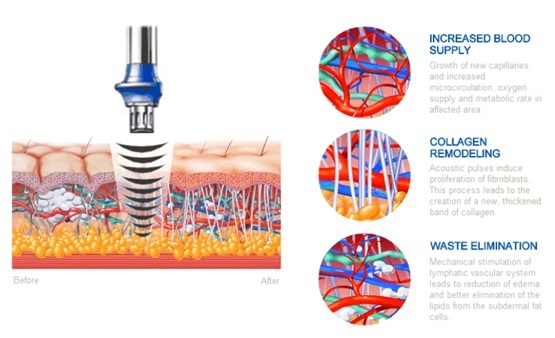 The technology behind Exilis Elite: layering allows for energy to be delivered to the various depths in our tissue. The different temperature settings allows us to treat the deep tissue all the way to the superficial layers. What does the X-Lift treatment feel like? The treatment has a built in temperature monitoring device to achieve clinically significant heat levels to guide over the area of concern. You will feel a warm sensation (think hot stone massage) as the radio frequency (RF) energy is delivered to heat deep tissue. Exilis Elite uses a “layering” advanced cooling technique to protect the skin while energy is delivered to various depths in the skin tissue. Changes in cooling during the treatment allow tissues to be heated, all the way down from the superficial layer. We recommend that you keep yourself well hydrated starting from 2 days leading up to your scheduled appointment and to ensure optimal comfort levels during the treatment, that you drink 1-2 glasses of water just prior to the treatment. How it works to stimulate collagen by disrupting its fibres and jump-starting collagen production. For our face series, you then relax under our therapists’ master strokes with a firming massage to complement the treatment. Finish off with a firming mask to lock in all the moisture. There is zero downtime and you can resume all normal activities right after. What problems can the X-Lift treatment help treat? Having no downtime, the X-Lift is generally suitable for most clients between the ages of 25 to 65+ who are looking for a quality, reliable procedure to improve their aesthetics appearance, be it for improvement in skin laxity, skin tightening or unwanted fat reduction. Generally, our clients see visible results from the first session. We recommend a series of 4 weekly sessions and then another 2-4 sessions on a monthly basis thereafter for best maintenance results. For the body treatment, we recommend combining the X lift with the X Wave Cellulite buster program for optimal results. Using the powerful energy of acoustic shock waves, the X-Wave is the leader in cellulite treatment, dermal firming and stretch marks reduction. Clinically proven for body contouring and body shaping, it is a non-invasive, quick and comfortable treatment to improve the appearance of cellulite, loose skin and stretch marks. Used in conjunction with our fat reduction treatments (i.e. either X-Lift or Coolsculpting offered at our clinic, Freia Medical), it helps enhance the results achieved. Think a strong, deep tissue massage around the treated area – painless and comfortable, you can literally sit back and relax whilst the acoustic waves pulse directly into your skin to break down the hardened connective tissues found in cellulite and improve your skin’s appearance. What problem areas can X Wave treat? This depends largely on the extent of the problem area. This is an effective maintenance program and we therefore recommend scheduling your first 4-6 sessions on a weekly / bi- monthly thereafter. For best results, maintain a healthy balanced diet and drink plenty of water to keep you hydrated.